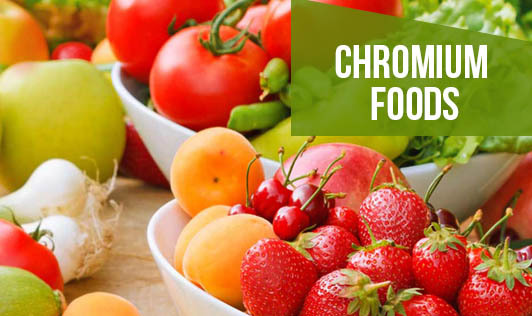 Chromium functions in the body to maintain normal cholesterol levels, regulate the body's use of fats, proteins, and carbohydrates, and help to maintain normal blood glucose levels. Since the body cannot produce chromium, this essential mineral must be obtained through food. The recommended daily intake of chromium is 25 to 45 mcg for adolescents and adults. Meeting these recommendations is relatively easy when eating an overall balanced diet. Foods and beverages that contain small amounts of chromium are orange juice, apples, red wine, bananas, green beans, potatoes. Signs of chromium deficiency include unexplained weight loss, fatigue or need for excessive sleep, excessive thirst, and impaired glucose tolerance.